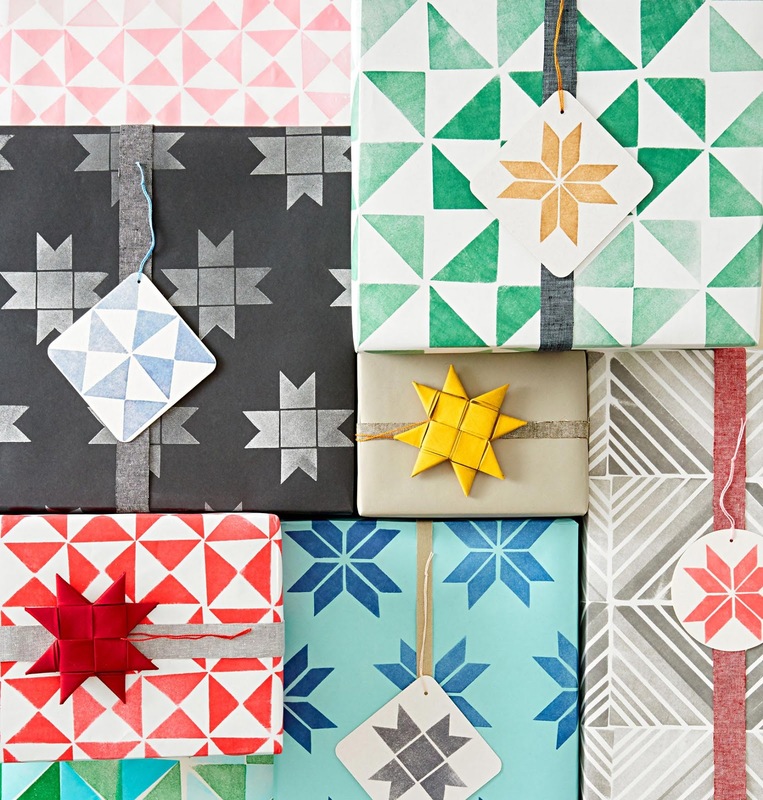 Dress up packages with quilt-inspired crafts, including ink stamps you make yourself. 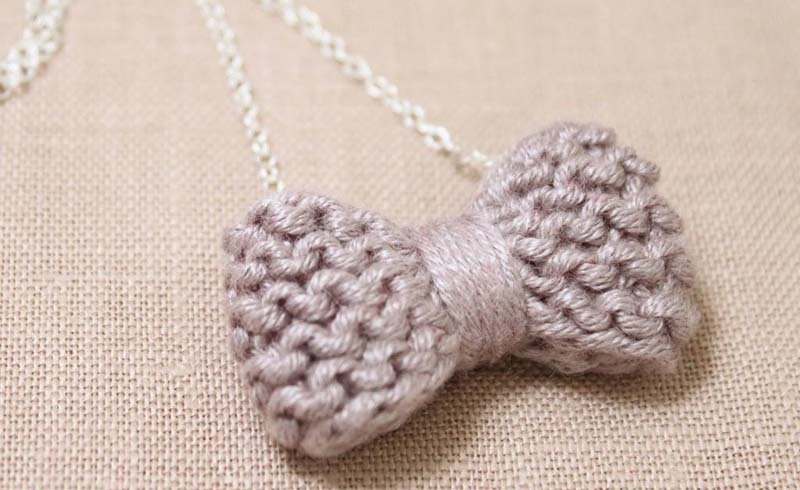 See how we made gift wraps and tags, a braided wreath, a knitted bow, bias-tape stars and more. 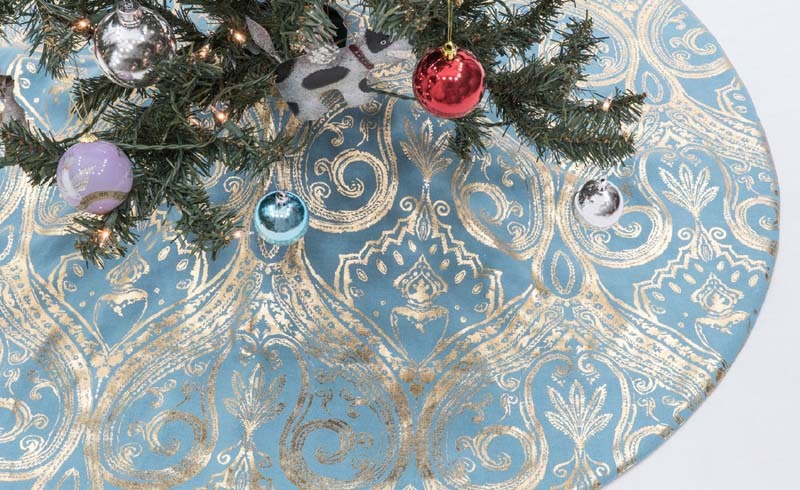 Use stamps to create custom wrapping paper (directions below photo). 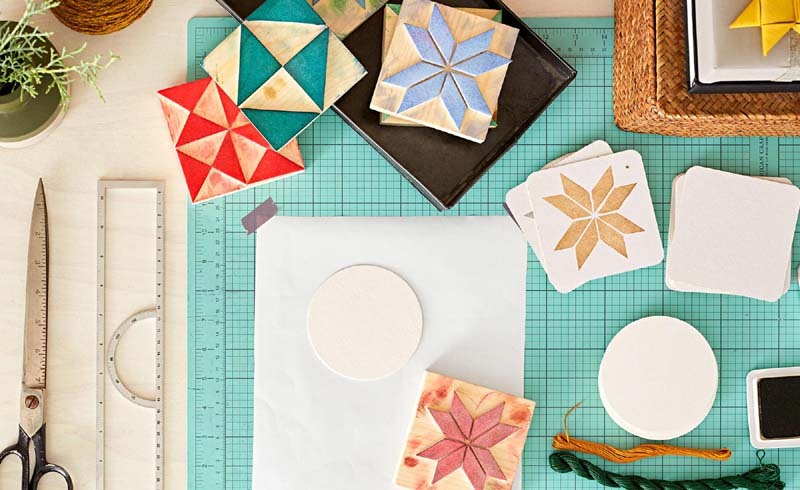 Turn precut paper coasters into stylish ornaments or tags with a single stamp of ink and an embroidery floss loop. 1 To design a custom stamp, measure and draw a geometric pattern onto craft foam (preferably the self-adhesive kind). 2 Use a blade to carefully cut out shapes. 3 Attach each foam piece to a scrap of wood to make the stamp’s pattern. (lf your foam isn’t self-stick, use spray adhesive.) 4 To make gift wrap, lay out a roll of butcher paper or other uncoated, non-glossy stock, taping down edges if necessary to keep it flat. 5 Stamp, using an ink pad, to create a repeating pattern. Tone-on-tone fabric makes for a stylish, lightweight accessory. Cut three strips of fabric, 2 yards by 9 inches each. Wrap each strip lengthwise around a length of wool roving. Seal with double-stick fabric tape. Secure with an elastic band at one end, and braid. Sew ends shut using an upholstery needle, then sew ends together. Cover seam with a bow. 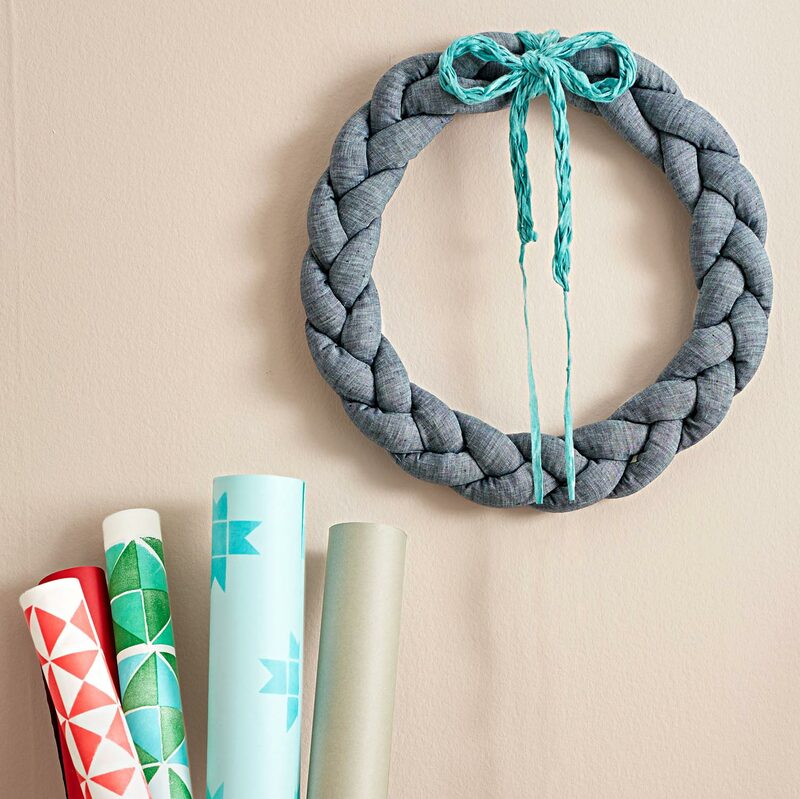 Recycled fabric yarn that's finger-knitted into a garland lends a textured finish to a fabric wreath. (How-to videos abound online.) You can also use it to trim a tree or green garland, or to adorn gifts. These intricate ornaments, a popular Christmas tradition in Scandinavia and Germany, spring from just four 1-foot-long strips of bias tape. (Folded, pressed fabric scraps work as well.) They double as cute gift toppers and also could tuck easily into an envelope alongside a Christmas card. 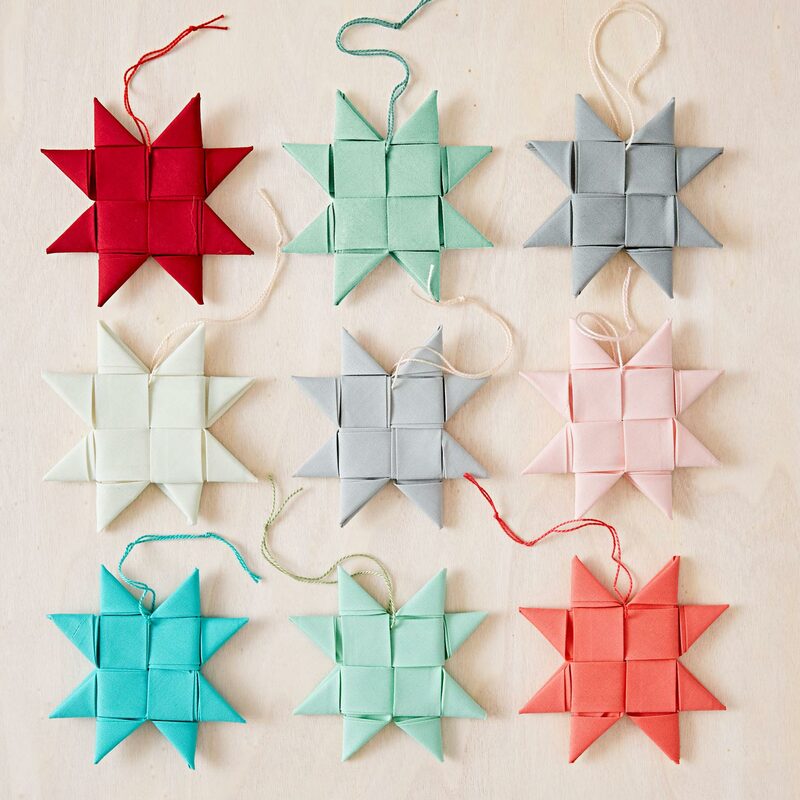 See how to make woven stars. 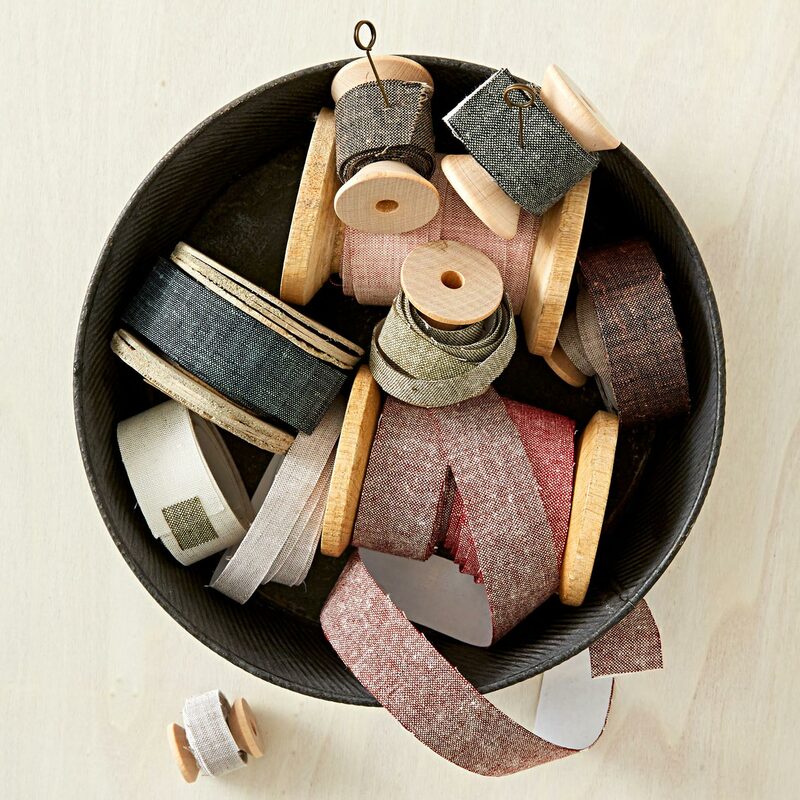 Reuse scraps of material by attaching fabric to one side of a roll of fabric adhesive (we used Aleene’s Fabric Fusion tape), smoothing any ridges as you go. Trim loose edges, and roll finished trim onto spools until ready to use. The adhesive prevents fabric from fraying and keeps ribbon in place when fastened to packages, creating a tailored look.